Home » Reviews » Is Freshly Right for You? Freshly is a delivery service that prides itself in offering all natural healthy foods free of gluten and sugars, and bursting with protein. We at Meal Delivery Experts, want to provide a review on this service so that those looking for a healthy food and are considering Freshly will know what to expect from them. Our hopes are to provide insight into the company, their service, and their food products, and help form an overall opinion of their brand based on our research and findings. Freshly is a meal delivery service that specializes in delivering healthy cooked meals to their subscribers. This is a company that has branded itself as the fresher option to other similar meal delivery services, while utilizing their team of nutritionists, professional chefs and entrepreneurs to make healthy eating more convenient to the masses. Their service is available in 27 states across the US mostly in the West Coast and Mid-West regions with some Southern states included. However, some of these states have zip code restrictions, yet they are working to expand their reach to the East Coast where their corporate office is located. Their kitchen, however, is located in Phoenix, Arizona and it is in this facility that all their meals are prepared. Freshly is a subscription service. So, their subscribers have to choose between 1 of 4 meal plans, with the smallest plan starting at $49.99 a week. Sadly, they don’t have an option for customers looking to try the service once, as the service is geared toward busy people who want a healthier lifestyle. Their meal plans, which they’ve named the Freshly Flex include plans that offer 4, 6, 9, and 12 freshly made meals a week, shipped all at once to their customer’s door. And if customers need more than 12 meals because they have other family members who want to join, customers can add another subscription to their accounts. Subscribers to this delivery service can choose which meals will be shipped in advance and can choose to keep their order the same or switch it up for the next week. Yet, there is a deadline to when a subscriber can switch their order since the company needs 5-6 days to prepare and ship the meals. Otherwise, Freshly tries to make their service ​easy to use and trustful. They even include an option to stop meal deliveries for a few weeks should the customer request it. Freshly has created an inactive site experience that allows customers to self-manage their subscription. Everything about their client’s plan can be adapted and customized by the customer, from the delivery address of specific orders to the day the food should be delivered. Customers are even allowed to choose meals weeks ahead of time. Freshly encourages their subscribers to check their meal selections every week because food options are occasionally phased out, which could be a letdown for some customers. Freshly offers a wide variety of food selections, many catering to the flavor palates of people all over the country. From Italian cuisines like their Baked Penne Marinara, to foods that might draw the attention of some Southerners like their Southern Style BBQ Pork. Or those who favor Southwest flavors in dishes like the Southwest Veggie Bowl. Freshly even spans their flavor profile into the Caribbean with Jamaican-Style Jerk Chicken as a part of their menu picks. And though these options may sound decadent, they are far from it. Every single meal offered on this website is gluten free, contains no processed sugars, and is all natural. This makes them the perfect service for people looking to create a healthier lifestyle without the stress of calorie counting. Freshly makes being healthy convenient. Each meal when clicked on provides a detailed description of how the meal was prepared, what ingredients were used, and most importantly, a nutrition chart revealing the calories of the meal, how many grams of carbs and protein the meal contains, among other things, so customers know exactly what they’re receiving when they choose a dish. They provide their convenience by offering both breakfast and dinner entrees and shipping these already prepared refrigerated meals to their customer’s door. These meals take no more than two minutes to heat up and enjoy. So even the busiest of customers can prepare a dish and be on their way. There are some companies that offer similar healthy food delivery services, but very few of them cater to customers who have specific dietary needs like allergies to gluten, shellfish, or nuts. Or clients that are vegan or vegetarian even though their vegan options are limited they are looking to expand their food products to accommodate this audience. 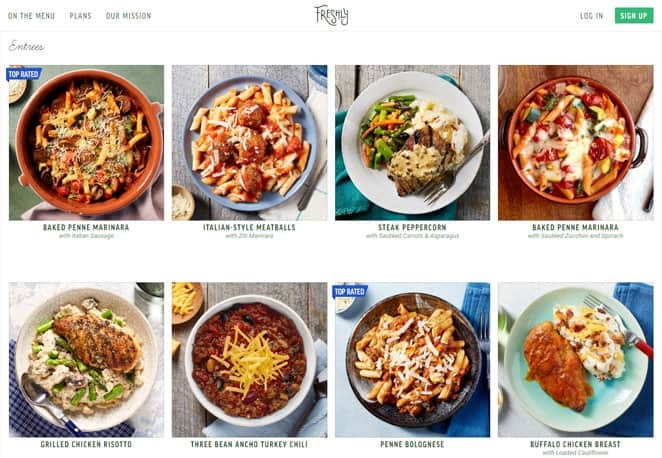 Freshly is mindful of all the specific preferences customers have, which is why they included a feature on their website that allows customers to filter out meals that include anything they don’t like or can’t eat. Also, Freshly prides itself on incorporating sustainability practices into its food delivery system by shipping their meals in biodegradable packages and recyclable containers. They even size their meals appropriately so that there is no food to waste. Which separates them from the competition. Here, we’ve included some major features about the Freshly website and service that could be a deciding factor in choosing to subscribe to their service. • Diverse Food Menu: Because of their varied food menu options, they can accommodate the palate of any number of customers and even introduce the adventurous foodie to a variety of flavor profiles that subscribers can experience every night expanding their taste to incorporate the range of options Freshly has available. Making this feature a real standout that could sway potential customers one way or the other. • Ability to Filter Food Options by Certain Ingredients: Because this feature is included on the Freshly website, customers are given the chance to filter out the foods that don’t fit their tastes, dietary needs, or will affect their allergies. This isn’t a feature seen on many delivery websites, however, it’s a very useful tool and a factor that should be taken into consideration. • Sustainable Packaging: This could be a feature that’ll draw mass appeal from earth-conscious individuals who still like to enjoy convenient meals. People who would rather make their foods to reduce their waste might be swayed by the sustainable practices of Freshly, making this a major deciding feature. • Multiple Subscriptions for a Single Account: Because of differing tastes, family members and friends who want to share the Freshly experience may need to have their own profile to incorporate the many flavors they love. Also, with the features that allow for orders to be shipped to alternate addresses, the entire family could partake in the Freshly experience. • Freshly Blog and Additional Site Features: The Freshly site includes a blog called Refreshed which offers articles on any number of subjects including recipes people can try, how-to articles geared toward teaching the average person cool cooking techniques and tips that should come in handy when preparing healthy meals for the whole family. Since Freshly isn’t a diet plan per se, customers don’t have to be exercising to enjoy the food. However, they are strong advocates of exercise and their blog provides healthy tips and guides to help anyone achieve the healthier lifestyle they desire. • Helps those wanting to start a diet or to partake in a healthier lifestyle get started: people making a life change have to start off somewhere, and many healthy food delivery services don’t offer the many features Freshly’s subscribers rave about. • Allows customers to choose their meal plan and customize their Freshly experience: Other healthy food delivery services aren’t as interactive as Freshly, allowing subscribers to actively choose which dishes they like, which they want more of, and which dishes they may want to avoid. • Meals can start as low as $8.99 a meal with the 12 meal plan: Their pricing options aren’t bad in comparison to what some people spend on takeout and delivery every day. So, clients claim that they’ve saved money through this subscription. • Their Sustainable promise ensures that subscribers to their service aren’t given an excessive amount of food: Freshly likes to reduce the amount of waste their products produces and this even includes their food. They give their customers just enough food to satisfy their hunger but no so much that a portion of it will end up in the trash. • Free Shipping: Everything on their website ships for free, saving their customers on additional fees and charges. • The company doesn’t give the option of trying one meal before subscribing: Sadly, looking over Freshly and their meal options revealed that this company doesn’t do sample dishes. They encourage people who want to try out their service to start off with their smallest meal plan. However, their smallest plan includes 4 meals. So, if you decide you don’t like the food after the first dish you’ll still have 3 meals to get through (or three meals that will sit untouched in your fridge). However, it does give you the option to try different kinds of meals so that you can experiment with what you like and what you don’t like from them should you continue the subscription. • The service is only available in 27 states: There is a huge bulk of the country that is still untouched by this service. Which could arise a problem if you subscribe to the service and you move outside their reach or you want to send a meal to a family member that’s in another state, but the service doesn’t cover their region. This is an issue that they’re addressing through their plans of expanding to the East Coast by adding another kitchen to the region in the not too distant future. • You cannot cancel the service in the middle of a delivery: If you decide that you change your mind about a particular dish or you believe you may have ordered something you shouldn’t have, there is no way to cancel that order after a certain time frame. If something is being shipped they can’t call it back so you’re left with meals that you don’t want but have already been shipped and paid for. • Limited in their vegetarian and vegan options: Though they cater to a variety of tastes and eating preferences, they are limited in their vegan and vegetarian selections. Though they justify this with the fact that they create meals high protein and low in carbs. There is still a large section of the population that is being missed due to this meager vegetarian and vegan options. Overall, Freshly is a good service, but is more geared towards people who want to have a consistent healthy experience, and not those only hoping to try healthy foods occasionally or once a month. So, if your someone just looking to find something new but you’re not really in the market for healthy meals every day then this may not be a good service for you. However, Freshly, tries to make subscribing to their site worth your wild, with unique and flavorful meal options. Making this a site for serious dieters and those committed to making a healthy lifestyle change. They try to make this shift as simple and convenient as possible by allowing the customer to be an integral part of their dieting experience. Freshly has made their clients health their primary mission. From the food selection to the nutrition charts and ingredients readily found for each dish. Freshly has created a service that takes the guess work out of dieting. They designed a business model that weeds out the customers who wouldn’t want to commit to the process, while targeting customers they know will continuously use the service for a long time to come. From the research we’ve done on this site, we’ve found several features that stand out and could be seen as a deciding factor when opting for the Freshly delivery service. For one, the diverse food menu is a selling point that caters to all tastes and allows people to experiment with flavors they wouldn’t normally try while remaining some of the healthiest food a person could have delivered to them. The ability to filter out food options based on certain ingredients is a useful tool that many delivery sites lack but is useful to people with allergies or specific food preferences. It makes sifting through the online menu simpler and convenient to use. The sustainable packaging Freshly provides is a bonus for conscious individuals who hesitate to have food delivered to them because of the wastefulness of the packaging that often-times can’t be recycled. This feature could be one that pushes many to take on Freshly as a service they want to try out. Multiple subscriptions for a single account squishes the argument of what everyone will be having for dinner because each family member can have their very own subscription and customize their food selection to match their taste so that no one is left eating something they don’t like. A feature like this can solve a lot of nightly debates and is great if a person is using Freshly for their family. Freshly even pushes this to the next level by allowing food orders to be shipped to different addresses, in case you are ordering for someone other than yourself like a family member who lives in a different home. The Freshly blog, Refreshed, is an excellent tool that utilizes articles to provide healthy eating and living, guides, and tips that many need to get started on their journey to a healthier lifestyle. This plan comes with many pros and cons as well—some of which could be deal breakers for potential customers. In addition, the pricing for such high-quality food couldn’t be better. Not to mention the health benefits of participating in the Freshly subscription. However, the fact that it is a limited service could greatly impact the people who could subscribe and how they are likely to use the service. Plus, the instant commitment to the service may deter some potential clients. Having the option to try one a meal before you subscribe usually persuades most people to try a service. However, Freshly understands the quality of their meals and are sticking to the steps of their mission which is to provide healthy, convenient meals to customers who want to change their lifestyle, which is business model better suited for their company. With Freshly, it is more about what they provide and how they provide it than to how many people they provide it to.Their business plan is targeting long-term repeat customers rather than single one-off customers who may or may not try their service again. It’s a business model that you rarely see in online delivery services, however it matches well with the Freshly mission, which is all about quality over quantity. There is no doubt that Freshly is filling a hole in the online delivery business by choosing to focus their company’s efforts into providing the highest-quality healthy food to busy people all across the country. They emphasis the importance of good ingredients and are popular for what they don’t include in their food than what they do put into their dishes. Looking over their customer reviews shows just how passionate their subscribers are about the Freshly service and proves their business model works for the type of food and they deliver and who they deliver it to. Because of these reasons, Freshly receives a high rating for overall food quality and for having and maintaining features that separate them from other delivery services. And though there are some drawbacks to their service, they are an ever-evolving company, always looking to expand their food options to fit the customers in their base and to expand into regions they have yet to go. They are utilizing a system that works and are feeling a niche in the healthy food delivery market that others have failed to corner. So, only time will tell if the drawbacks of this service will fade leaving only the reasons their customers stay loyal which is quality, healthy food at reasonable prices delivered straight to their door. So, if you’re looking for a delivery service that provides consistent healthy food to your door, then Freshly might be what you’re looking for. Needless to say, our review of freshly is based on research gathered from their website.